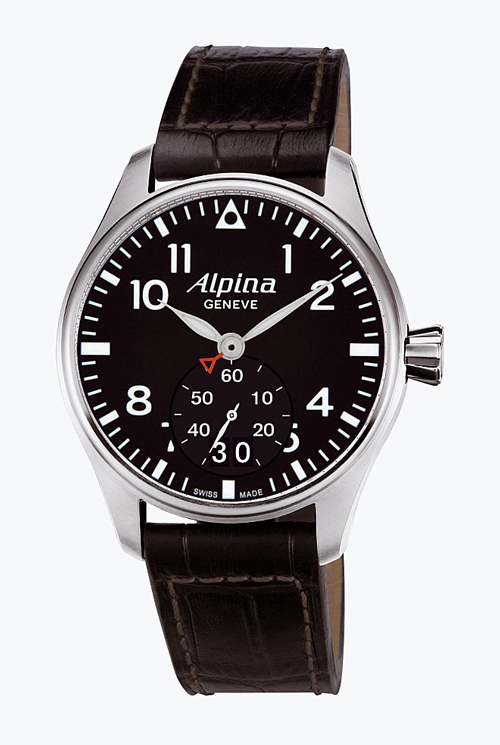 Alpina is the brand that has been known for generations as the ultimate provider of watches worn by aviators. Now, the company is further expanding its reputation as a manufacturer of watches that can not only withstand the most demanding environments, but which can look incredibly stylish and elegant at the same time. With a design that somehow manages to combine a completely unique and innovative appearance with a timeless, classical look, Alpina is delighted to announce the launch of two new members of their immensely popular Aviation Collection. The Alpina Startimer Pilot Big Date is sure to be a limited edition model that enthusiasts will view as a "must have" timepiece for their collection. Do you want to know the date, as well as the time? Look at this watch! The extra-large date display is ingeniously placed at the six o'clock position--unmissable yet unobtrusive at the same time. 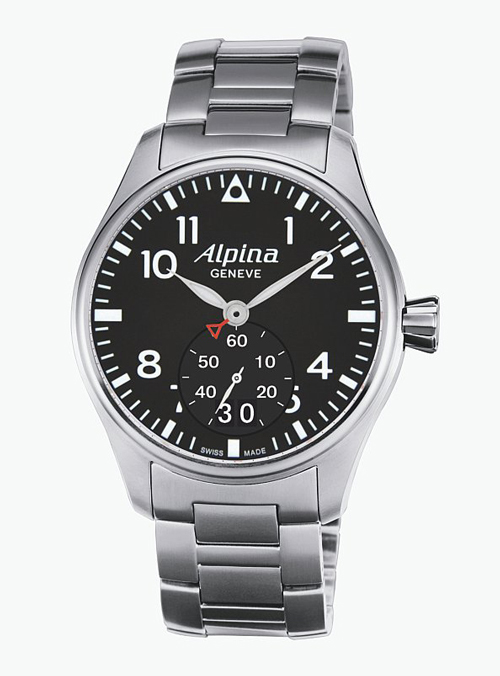 Don't worry; this watch still boasts all the features that make it uniquely and unmistakably an Alpina. The company's signature red triangle still stands out at the base of the minute hand, and the incredibly durable, elegantly brushed and highly polished two-part stainless steel case surrounds the inner workings. With a diameter of 44 mm and a beautiful but hard-wearing sapphire crystal with an anti-reflect coating, the large, luminous white numerals and luminous white hour and minute hands stand out proudly from the striking black face. The small second hand is displayed in the bottom half of the watch face and actually integrates the large date display. In acknowledgement of the excellent craftsmanship and dedication to perfection of another world-famous aviation brand, and one with which Alpina has a close working relationship, the Startimer Pilot Big Date has a Cessna aircraft beautifully engraved on the case back. Alpina watches are renowned for their reliability, and the new Startimer Pilot Big Date models are no exception. The quartz caliber movement has 6 jewels, a battery life of 48 months, and the watch is water resistant to a depth of 10 ATM (300 feet). Each of the two models is presented in a limited edition of just 8,888 pieces. 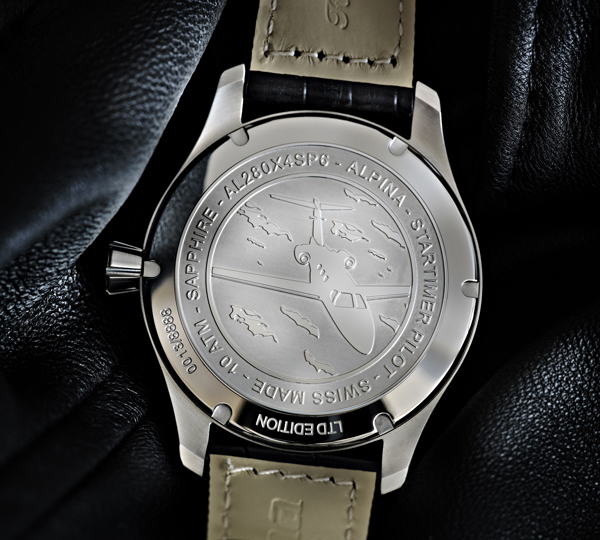 The precise number of each watch is carefully engraved on the back case. One edition comes with a striking black leather strap with a folding stainless steel buckle. The other is presented with a gleaming metal bracelet; visually stunning and suitable for all conditions, no matter how extreme! Functions : Hours, minutes, small seconds, big date.